Cool Record Edit is an ideal solution for audio editing and mastering. The program contains everything you need to create great sounding recordings and audio CDs, including professional tools for recording, analysis and editing. The Cool Record Edit user interface was designed with speed, accuracy and ease of use in mind. A large range of high quality audio tools and effects are integrated in Cool Record Edit – including tools for dynamic processing, equalizing, numerous effects such as echo, amplification, noise reduction, reverb, chorus and flanger, as well time stretching and key transposition tools. Recordings distorted by noise, clicks, crackle, clipping or missing high frequency content can be restored. 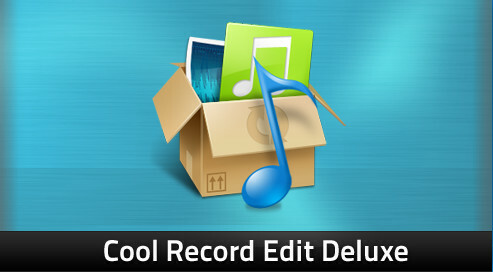 Cool Record Edit Deluxe is designed to be a very easy and intuitive to use audio editing package. Within minutes you will be able to open or record a file and edit it. But if you take time to explore the other features you will find many powerful tools designed with the professional sound engineer in mind. Cool Record Edit helps you transfer tapes, LPs, live performances, Internet radio, TV, DVD, or any other sound source to your hard drive. The software helps protect your valuable recordings – just set the sound source, the recording quality, and volume, then start recording. Cool Record Edit Deluxe helps you transfer tapes, LPs, live performances, Internet radio, TV, DVD, or any other sound source to your hard drive. The software helps protect your valuable recordings–just set the sound source, the recording quality, and volume, then start recording. Cool Record Edit Deluxe supports a wide range of audio formats, such as MPEG (MP3, MP2), WAV, Windows Media Audio, Ogg Vorbis, Audio Tracks and Dialogic VOX. It is easy to convert an audio file from one format to another. • Recording. Record new audio file from a microphone or another sound source. • Editing. Open, create and save audio files. Play an audio file or any part of it. Visually edit an audio file (Cut, Copy, Delete, Paste, Paste From File, Mix, Mix From File and Insert or Delete noise or silence in an audio file). • Display. Display a waveform window of an audio file and apply zooming. • Markers. Use markers in your audio file to quickly select between different selections! When you click the Tools > Audio CD Ripper item, you can makes direct digital copies from audio CDs and saves them as MP3, WMA, OGG, and WAV. Supported CDDB and ID3 Tag. When you click the Tools > Audio CD Burner item, you can use the Audio CD Burner to burn custom high-quality CDs from your favorite MP3s and play them back in your car or home stereo or portable CD player! It is fairly simple to use and just a couple of clicks will get you burning. Have more fun with your downloaded MP3 and ‘ripped’ mp3s or the sound have recorded!